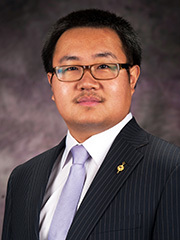 Peter Zhang, Kansas State University assistant professor of industrial and manufacturing systems engineering, has been named one of 18 Outstanding Young Manufacturing Engineers for 2018 by the Society of Manufacturing Engineers. Awardees, who must be age 35 or younger, are recognized for their exceptional contributions and accomplishments in the manufacturing industry. The society has supported the manufacturing industry for more than 85 years, working closely with manufacturing professionals, companies, educators, schools and communities to share knowledge and resources that generate solutions to manufacturing industry challenges. Zhang received his doctorate in industrial engineering from K-State in 2014 and bachelor's degree in mechanical engineering from Dalian University of Technology, China in 2009. His research is focused on advanced manufacturing processes and their application in bioenergy, aerospace materials and healthcare. His research findings have generated more than 60 publications. A passionate educator in the manufacturing field, he has taught manufacturing courses to more than 150 students every semester in the College of Engineering since 2015. Zhang's research and education activities have been supported by the National Science Foundation through four grants, and he has provided research experiences for more than 10 undergraduate students to participate in different NSF projects.